On Monday Cody and I adopted two 6 month old kittens. They are so precious it's almost sickening! I happened upon a post someone put up on our local "freecycle site" that was hoping to find them a home, apparently the person who rented her downstairs was the owner of the two cuties, but decided he was going to move and was planning on abandoning them?!?!? What a jerk. Anyhow, his loss is our gain, these boys have already stolen our hearts. They are the sweetest and most playful little guys you've ever met. I took some videos, but they are sideways, and I don't know how nor do I feel like figuring out how to flip them. I will be sure to video them again soon so that you can see them in action. Cody made some cat toys that they just looooove, one is from a t.v. antennae with a string tied to the end, and some squares of cardboard attached to the end of the string. Just like one you can buy in the store but better since it was FREE, haha. And it really gets some acrobatic action out of them!! One thing that is particularly unique about them is that they are both Polydactyl. 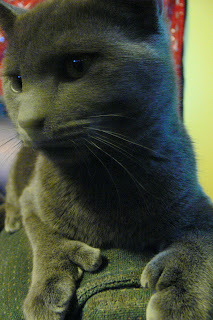 Polydactyl translates to many digits, which means that they have extra toes compared to normal cats. 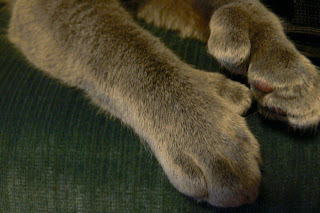 Our little boys both have one extra toe but only on the front paws, although with other Polydactyl cats there can be different combinations of extra toes. I know, if you've never seen one in person it can seem sort of weird. My first time seeing a cat with what looked like mittens on their feet happened when I was about 16 or so and I remember thinking then that it was just so precious. I've been doing quite a bit of reading about these types of cats, and there's a lot of interesting facts and theories I've found so far. They are still getting used to being in a new house, and then you also have the power struggle between the new cats and our existing one, but Steve is supposed to come a get him when he is settled in his new place, until then he'll just have to play nice! !